For the Intelligent World Hackathon, submitted apps should address challenges that intelligent lighting and their sensors can help solve in both indoor and outdoor environments. Outdoor lighting sensor data can help address city opportunities, such as traffic, parking, public safety, pedestrian/urban planning, and economic development. Indoor lighting sensor data can improve productivity and revenue opportunities in retail and commercial buildings. For a chance at an award, all submissions must be entered into one of the following prize categories. (When submitting, you’ll be asked to indicate a primary prize category for your app You will also be asked to provide a secondary category (if applicable). The hackathon sponsor may choose to re-categorize your entry if they deem it appropriate. Please note that to be eligible for the Grand Prize, submissions must include one or more of the Intelligent Environment Cities services: Traffic Planning, Parking Planning, Pedestrian Planning, or Public Safety. Parking - Applications entered into the Parking category must use the Intelligent Environments Parking Planning service and focus on parking-related activities that occur in a city. It has been estimated that there are just over one billion operational vehicles in the world. Also, it is estimated that human population will grow from seven billion today to over nine billion by 2050. With this demand and usage of vehicles, on-street parking is a critical service for a city to provide to its patrons. GE’s Intelligent Environments Parking API service offers near real-time and historical data from intelligent LED sensors installed on roadway and parking lot light poles. Metadata such as whether a parking space or parking area is occupied by a vehicle is extracted from intelligent streetlights in a city. How could this unique data be used to improve city operations and the lives of patrons in your city? Traffic - Applications entered into the traffic category must use the Intelligent Environments Traffic Planning service and focus on traffic-related activities that occur in a city. Traffic can be defined as any movement of vehicles in a city. A vehicle's primary purpose is to transport humans and/or goods from location to location in a city. Traffic patterns can be used as key indicators for the type of activity in a city such as: population growth, visitor activity, roadway and signal planning, parking needs, local economy patterns, congestion causes, public transportation effectiveness, and other public safety needs. While there are many ways to get traffic information today, GE’s Intelligent Environments Traffic API service offers near real-time and historical data from intelligent LED sensors installed on roadway and parking lot poles. Metadata such as vehicle speed, direction, volume, and lane use are extracted from each vehicle that passes each intelligent streetlight in a city. How could this unique data be used to improve city operations and the lives of patrons in your city? Applications entered into the Public Safety category must use the Intelligent Environments Public Safety service and focus on public-safety-related activities that occur in a city. With the expected growth of population and urbanization of cities, ensuring citizen and visitor safety is important to a city's stability. Today’s cities use cameras to help reduce crime and enhance safety awarenes; however, budgets are often too limited to expand camera infrastructure into every public space in a city. GE’s Intelligent Environment Public Safety API service provides real-time and historical images/video from each intelligent LED light installed in a city, which means cities can affordably have ubiquitous camera coverage where needed. Using this data, demonstrate how this media can improve city operations and the lives of patrons in a city. Applications entered into the Pedestrian Planning category must use the Intelligent Environments Pedestrian Planning service and focus on pedestrian-related activities that occur in a city. It is estimated that human population will grow from seven billion today to over nine billion by 2050. As the population grows and urbanization rates increase, pedestrian activity in public areas will increase. Pedestrian activity includes everything from walking, shopping, crossing streets (legally and illegally), and attending events to other recreational or business-related activities. Cities need to plan for and respond to pedestrians' needs to ensure safety, promote economic development, and provide other services that accelerate prosperity. GE’s Intelligent Environments Pedestrian planning API service offers near real-time and historical data from intelligent LED sensors installed on roadway and parking lot light poles. 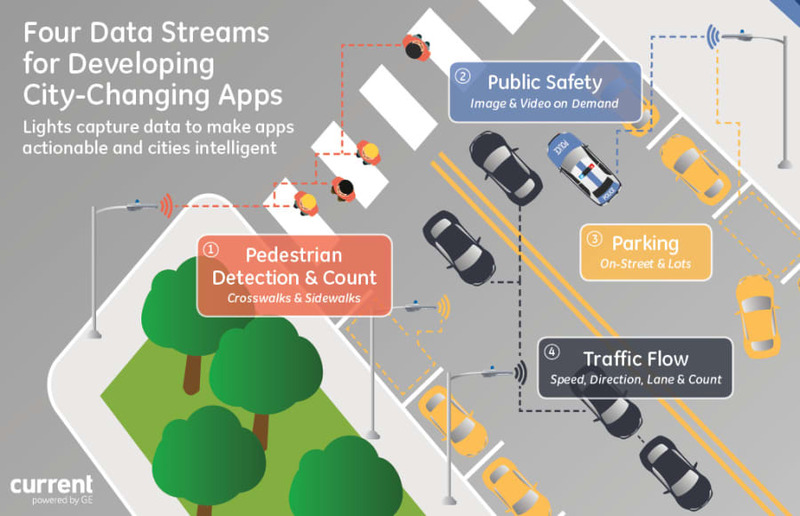 Metadata such as whether a pedestrian is in a region of interest and how many pedestrians are in that region are extracted from intelligent streetlights in a city. How could this unique data be used to improve city operations and the lives of patrons in your city? 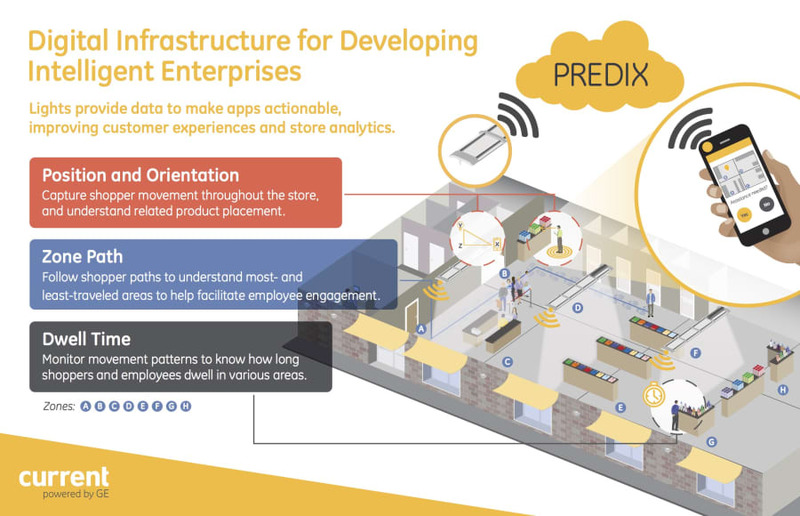 Applications entered into the Intelligent Buildings category must use one or more of the Intelligent Enterprises services on the Predix platform. Intelligent Building data can be grouped into two categories: Indoor Intelligence and Enterprise Environment. Indoor Intelligence looks at historical data such as positioning (where a mobile device was), dwell time (how long did a device stay in a specific area or building), and path (where did a device travel within a space). Let’s look at each data type in more depth. Purpose of the data: Retailers would like to learn more about their shoppers' experiences and behaviors to identify opportunities for improvement. What is captured: The Historical Positioning API collects a mobile device's position (X and Y) as well as the height of the device (Z axis) and the device's orientation. Use case: As an example, this data enables a store's management to identify shopper flows across different times within each of their stores. The retail management could choose to view the Blue-Dot (Position) data using a timeelapsed service in Predix. A heatmap view could help to analyze the shopper patterns and best marketing opportunities as well as the flow impact of changes to the store layout (A to B comparisons). Purpose of the data: Retail brands would like to validate their spending for rental space or position within a retail store. Store owners would like to know the value of their available shelf space. What is captured: The Historical Dwell Time API provides a historical collection of position data identifying when a mobile device's position has entered and exited specific zones or areas within a store/building. These zones are defined as a polygon on a map. Additionally, the orientation can be used to assume the shopper’s gaze. Use case: Potentially a retailer would capture metrics on the different zones/departments or create specific zones around products during marketing campaigns to measure exposure and determine impact to dwell times. Another use case might be to trigger a concierge support function based on longer dwell times in specific areas. For example, dwelling for a few minutes in front of the “pickles” triggers a pop-up on the retailer's app asking if the shopper needs assistance. If yes, the store associate is directed to the device location to help the shopper. Purpose of the data: Building owners would like empirical data to understand flows and utilization of space within a building. What is captured: The Historical Path API collects position data and analyzes it to communicate the specific order of zones traversed. Use case: Possible solutions could include dashboard analytics solutions like shopping mall patterns. In what order do mall shoppers visit the stores/brands? What order of zones in a specific retail location do shoppers generally travel through (men's, shoes, sports, grocery, checkout)? Enterprise Environment is focused on the efficiency and performance of the facilities (or buildings) themselves. Purpose of the data: Companies would like to understand and optimize the performance and utilization of facilities in their real estate portfolio. What is captured: The Enterprise Environment RESTful service provides environment metadata collected from intelligent lighting sensors placed at indoor and outdoor locations of buildings. The available information includes: Illuminance, Occupancy, and Temperature. This data is continuously collected and stored with a timestamp in the Predix Cloud. It is then presented as historical information for an individual sensor.